Outlier Technology wants to end the pain of hunt-and-peck typing on tablets and mobile phones with its new mobile typing device. The company is seeking Kickstarter funding for its TREWGrip mobile keyboard, which allows users to type with both hands while sitting, standing or walking. TREWGrip has a full, standard QWERTY keyboard layout that is split and rotated so users can both grip the device and touch-type. 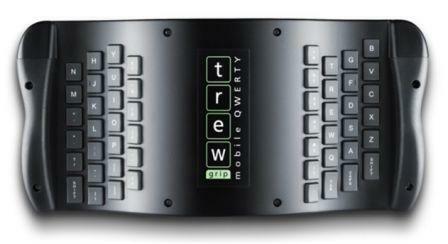 The company calls its configuration, “mobile QWERTY.” With a mobile dock, TREWGrip connects wirelessly to a mobile device or computer via a Bluetooth connection. There’s also an optional gyroscope to control on-screen mouse movement by tilting and turning the device. “Despite everyone's best efforts to use two thumbs or hunt-and-peck on touchscreens, mobile devices and their owners must become immobile to accomplish real work, defeating the purpose of the modern technology,” said Mark Parker, president of Outlier Technologies and inventor of TREWGrip. “TREWGrip solves this challenge." The company says TREWGrip’s configuration gives users an ergonomic alternative to a traditional keyboard and mouse. The company’s Kickstarter campaign will support product development and the initial production run, currently set for early 2014. According to the company’s product testing, the learning curve for TREWGrip is virtually the same as a split fixed-angle ergonomic keyboard, or approximately 90% of the user’s typing speed after 10-hours of use. This is because learning TREWGrip only involves physical learning, whereas other methods of typing that deviate from the QWERTY key layout involve some combination of physical and cognitive learning. The company reports that as soon as touch-typists stop thinking about the keys and start relying on muscle memory, typing speeds begin to increase rapidly. 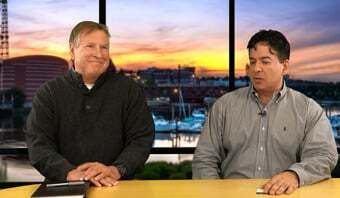 This Kickstarter campaign seeks at least $100,000 by Thursday, Sept. 5, 2013, at 10 a.m. EDT.